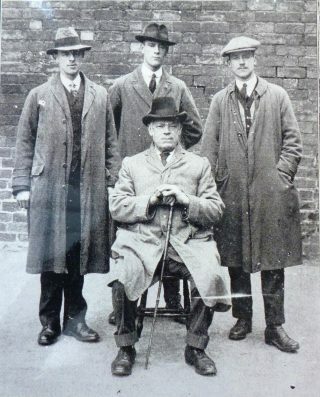 This picture in the Cheltenham Chronicle and Gloucester Graphic shows retired PC Henry Hayward and his three sons, also police officers, in May 1915. It must have been taken just before the three young men enlisted in the Army with many of their colleagues in the Police Force and their father, like many former officers, came out of retirement to cover their duties. Henry Hayward would have been around 66 years old when his sons left for France! The Register of Rural Constabulary also includes information about the three sons, pictured with him in 1915. Walter Hayward joined the Police in 1913 and his brothers Robert and Edward joined in 1914, not long before the outbreak of war. Details of all three are included in the Register of Rural Constabulary and this gives clues about what happened to them. The three Hayward bothers joined the Army together in 1915 and all three survived the war, rejoining the Police Force after the end of the War. The Register of Rural Constabulary and the series of General Orders show what happened to them. 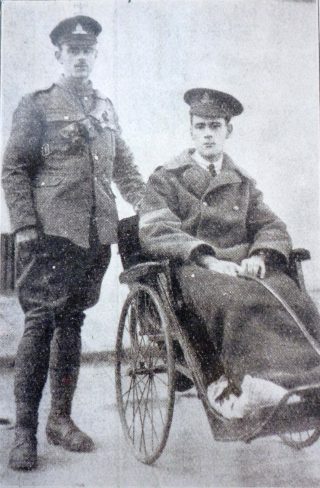 The two younger brothers, Robert and Edward, were both wounded and although it is not clear what happened to Edward Hayward, we know that both Robert’s feet were amputated. A picture in the Cheltenham Chronicle and Gloucester Graphic shows him in a wheelchair. The series of order books show what happened to him next – his poor health meant that he was dismissed from the Police Force in March 1918 but his health improved and at the beginning of December 1918 he was able to rejoin the Police and served as an officer into the 1930s. The order books show that he had an active career despite his disability and was commended three times, the second time for “prompt and successful action in searching woods during the night for a boy aged 8 who was lost”. Edward rejoined the Police Force early in 1919 and served until 1930 when he was pensioned on grounds of ill health. The order books show that he was one of the officers who attended the King’s visit to Cirencester in 1923. We know that Walter Hayward survived the war uninjured and rejoined the Police Force in 1919. The order books show that his promising career was cut short by an unfortunate and fatal accident. The circumstances as described at the Inquest were reported in The Citizen in some detail as you can see here. It is interesting to see that the medical evidence showed that Walter Hayward had a particularly thin skull so it is possible that this had contributed to his death. Inspector Brotheridge and the Deputy Chief Constable expressed their sympathy with Walter’s widow and family and noted that he was one of the large number of officers who had volunteered in the early days of the war and one of the few who had come through without a scratch. I love this page because it shows my family line. and thank you for your good work.